Greg du Toit contracted several diseases and parasites while spending months half-submerged in a Kenyan watering hole. But he also captured a rare and stunning look of the wildlife he encountered nose-to-lens. This narration documents my pursuit of that ever illusive frame, which became an obsession that lasted a total of eight months and took me along an eventful journey, during which I contracted numerous parasites (some quite possibly unknown to science), not to mention the thousands upon thousands of insect bites. Having the privilege of being able to construct my own private photographic hide, I went about the task with vigour and determination. After one week, I had completed digging a hole deep enough to conceal my entire body and had placed a zinc roof above it. Situated just two degrees south of the equator, I knew that the hide would not be overly comfortable, but I planned on getting my shot soon, and decided to dive in. The next couple of months involved profuse sweating and gave me a small taste of what trench warfare must have been like! Every morning and every afternoon I could be found in my foxhole, along with at least a dozen Tsetse flies. In two months, only one herd of very skittish zebra put in an appearance. In fact, they were so shy, that I had to sit motionless for hours whilst being bitten by the dreaded Tsetsies, unable to swat them as the slightest movement would send the zebra running for the hills (or rather onto the dust plains of the Rift Valley). Another problem I encountered, was the resident troop of Olive Baboons, who seemed to annoyingly wait until I departed each day before coming down to drink. After drinking they would inspect my hide and often times treat it as a long-drop lavatory. It was hard to believe that this vulgar behaviour was not intentionally antagonistic! After two months, the pungent smell left by the baboons combined with the numerous Tsetse flies and searing heat, meant I had come to that familiar place whereby my photographic mind leaves the realms of sanity and enters a more psychotic obsessive dimension. Photographing the Zebra just that once, did however help me realize that if I was to get the ultimate lion-drinking frame, I would have to change my angle and get closer to the water's edge. Subsequently, I reverted to plan B, which entailed pitching a tiny dome tent on a small island of dirt situated in the middle of the waterhole. The location was good in that it would bring me closer to my subject and gave me a better angle, but my tent was painfully obvious. The baboons could not reach my new location though and therefore I had no need to block my nose with a clothes peg. The flies however were worse, as they would squeeze in through the tiny zip opening and then get stuck on the inside. At any one time, I had at least a couple dozen buzzing around, but unlike my trench days I at least could swat them. Although, it must be said that Tsetse flies do not respond to mere swatting and in the weeks that followed, I perfected my ‘squash and role' technique. So once again, I patiently set out to capture the elusive beasts drinking. It was nearing October, the hottest month in the Rift, and temperatures were soaring above 40 degrees Celsius. Surely, these wild and elusive cats would succumb under the oppressive heat and drink in the late afternoon or early morning? As the weeks turned into months, the tent proved to become a most uncomfortable location! After blowing away several times during a series of severe dust storms, I resorted to carrying large boulders inside, to perform the stabilizing task that the pegs could not. The slightest breeze would also cause the tent canvas to rustle, sending any potential photographic quarry running. After spending countless more hours, days and a further two months cooped up in the nylon sauna , I had the opportunity to photograph the same herd of Zebra. The lion however, remained elusive, leaving only tracks under the cover of darkness, seemingly relentlessly bent on only drinking at night. Returning home each evening and hearing the tormenting roars of the pride in the valley below, seemed to antagonise me to the point of returning the next day until finally, one afternoon, the oppressive heat got the better of me. I leapt into the waterhole, only a few feet deep and wallowed about like a warthog in the putrid soup-like water. While wallowing, I began to ponder how wildlife would perceive a bobbing humanoid head? Lion in particular, recognise human beings almost exclusively by our upright posture, so my years of working as a Wilderness Trails Guide had taught me. The relative refreshing coolness of the water combined with an even better camera angle tempted me to change my strategy. So down came the tent, and the pale green water itself became my new photographic hide. With my rear end ensconced in the muddy bottom, all that protruded above the water were my head, hands and camera. The following months facilitated the most excellent opportunity to enjoy some prime bird watching as I got to know a pair of Egyptian Geese especially well. Like big brother, I watched the pair of them mate; build a nest; lay eggs; raise chicks and then, once fully grown, chase the young birds away with much fuss and honking. On one occasion, the tiny goslings swam right up to me, seemingly most puzzled by my presence or perhaps they were admiring my Nikon F100? The days, weeks and months that followed were incredible in that the water masked my smell and sound, allowing me to view a plethora of life that existed in the area. My list of mammalian subjects grew tremendously, and now included Waterbuck, Impala, Bushbuck, Reedbuck, Warthog and my old sanitary friends - the baboons. The amount of unseen life that existed and survived on that one small patch of water astounded me, and having a frog's eye view of the world, gave me a completely new sense of awe for the wonderful creatures that inhabit our splendid continent. I also especially enjoyed the White-throated Bee-eaters who would dip into the water just inches from my nose! The early mornings were a special time in that the Khori Bustards would come in for a drink, often times cocking their heads in their typically animated manner. In the afternoons, I more than once witnessed Lanner Falcons and African Hawk Eagles swooping in and snatching drinking doves just a few meters in front of me. The lion however, remained agonizingly and frustratingly absent! After eight months, my wife's patience was wearing thin and my skin was covered not only in strange bites but persistent red bumpy rashes, the cause of which I finally put down to baboon urine! One particular week, the mercury in the camp's thermometer soared way above forty, as I once again found myself firmly entrenched in my muddy quagmire. The heat wave persisted throughout the week until late that Friday afternoon, when it seemed to be reaching breaking point. Sitting in the water was no doubt the best place to be in terms of escaping the heat, but the light was about to fade and soon I would have to leave the waterhole and return to camp for another impatient night of torment. Just as I was about to pull my rear end free from the muddy bottom and begin my trek back up the escarpment, my ever-faithful pair of Egyptian Geese leapt from the bank and hit the water with furious honking and hissing. Wondering what on earth had alarmed the geese, I quickly scanned the horizon, only to see two full-grown lionesses sauntering purposefully towards the water. This was it, I thought: eight months of literal blood, sweat and tears and now finally, my chance to ‘get it right'? Lowering my head, I scanned my camera settings and pushed my film to cope with the lowering levels of light. Looking up again, I was horrified to see two desperately thirsty lionesses lapping away at great pace a mere five meters in front of me. I recall noticing their piercing yellow eyes and their bulging muscles, which seemed to tower above me. Had I been standing, my knees would have been knocking! Was it possible that the two felines had not noticed me? My subconscious being had decided that this was highly improbable, which manifested itself through the uncontrollable shaking of my hands. Unknowingly, my adrenal glands had been pumping adrenaline into my body, which now needed to escape but had nowhere to go, as I had to sit motionless. The result was that my hands began to shake vigorously, in such a way that even my vibration reduction technology would have been rendered utterly useless. Closing my eyes and lowering my head, I became conscious of the irony unfolding before me. Here I was, after months of patience and preparation, with my ultimate shot just meters away and no way to capture the image? Taking both deep and shallow breathes, I was grateful that the heat had infuriated the thirst of the cats, who kept drinking litre after litre of muddy water. Finally, I managed to psychologically remove myself from the situation and brought my shaking hands under some degree of control. The next twenty-eight frames were a blur in my memory as I triggered my shutter, in the hope that the resultant images would indeed be sharp and well composed. I was shooting handheld and in horizontal format with both arms concealed below the water and I knew that in order to get my shot, I would need to switch to vertical format? Slowly tilting my camera vertically, my right elbow began to protrude from the water. Both lionesses immediately stopped drinking and fixed their intent gaze on me! I paused just long enough to say ‘our Father' and pressed my shutter button just twice and more delicately than ever before. The sound of my shutter mirror flipping up seemed so loud that I expected an echo off the Rift wall! The next minute was tense to say the least, as the cats continued scrutinizing me, trying to decide what exactly I was? It was at that moment that I realized I was potentially treading on new ground in terms of animal behaviour? If the lions did not recognize me as a human, could they perceive me as prey? This was not the time for rhetorical questions and I slowly lowered my elbow back into the water. To my utter relief, the felines continued drinking. With the light fading fast, I found myself in somewhat of a precarious predicament, as the lionesses had stopped drinking but were still sitting on the water's edge and still nonchalantly interested in me! Once it was dark, I would not know where the cats were, and so I decided to make as eloquent an exit as possible. Holding my precious Nikon in one arm, I used the other, to clench the muddy floor and pull myself towards the opposite side of the waterhole. Every time I moved, the predator duo would prick their ears and fix their gaze on my protruding head. Inching and pausing my way to the opposite shore, the next ten metres proved to be the longest journey of my life! The water began to get shallower and shallower until half my body was protruding above. The two lionesses had, by now, become intensely intrigued as to exactly what kind of creature I was? With the water becoming alarmingly shallow, I turned onto my belly and flopping about like a catfish, I inched my way out. Deciding to run the gauntlet, I leapt to my feet and ran over piercing devil thorns like one of Shaka Zulu's warriors until I reached the heavenly sight of my parked Land Cruiser. On my way their, I glanced over my shoulder only to see two lionesses looking utterly shocked and somewhat disgusted to have discovered that I was after all a human being! With my twitching body still full of adrenaline, I drove back to camp and carefully placed the precious film in the gas fridge. The film would have to stay fresh for another couple weeks before returning to South Africa to be developed. How was I going to explain to my photographic lab that they should take extra care with the precious commodity? A few weeks later, feeling decidedly ill, I arrived back home and went for blood tests, the results of which revealed an assortment of parasites, including bilharzia and a few other worms. Our family GP phoned late that Saturday evening to comment on the alarming blood test results, asking me if I had been in any foreign bodies of water? Republished with permission from Greg du Toit. 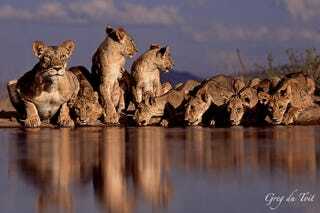 Greg du Toit is a professional wildlife photographer and 8th generation African. Born in South Africa in 1977, he has lived and worked in four different African countries. From a young age, he has engaged the wilds of Africa, and there was never any doubt as to what he would do with his life. It was therefore no surprise that after completing his tertiary education in Nature Conservation, he went to live permanently in the African bush.